'The gullsâ gab and rabble on the boat-bobbing sea ... scamper of sanderlings, curlew cry ... he got a little telescope to look at birds...'. 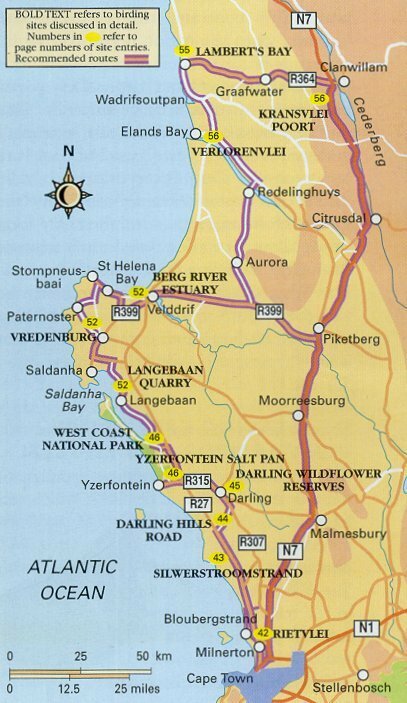 The southwestern Capes western seaboard, stretching along the Atlantic shores from Cape Town northwards to the Olifants River, is best known for its superb beaches, bountiful sealife, internationally recognized coastal wetlands, and spring wildflower displays that are nothing short of spectacular. Birding is excellent: there is an abundance of migrant waders and other waterbirds, and rewarding strandveld birding. 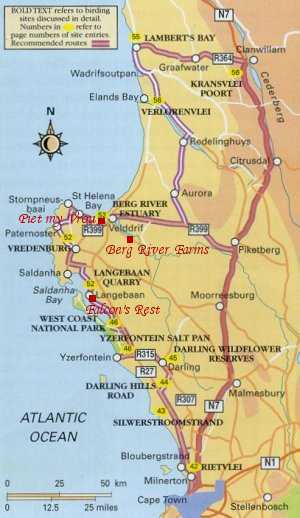 Highlights range from the quiet elegance of a Black Harrier quartering low over the scrublands of the West Coast National Park, to the frenzied activity of the Cape Gannet colony at Lamberts Bay. and a host of waders.